Hitting up forums, sticking around blogs like Teach You to Sew and communicating with people in the know is a great way to advance much faster on your sewing journey. However, one of the biggest challenges you will come across while trying to use said resources is understanding the “language” of sewing experts, or the language of sewing. Well, although it’s not exactly a different language, but when someone’s sharing a lot of in-depth, useful sewing stuff, they will likely be using many sewing terms that you may not understand at all. And this would obviously prevent you from learning most of what they are trying to teach you and the others like you. 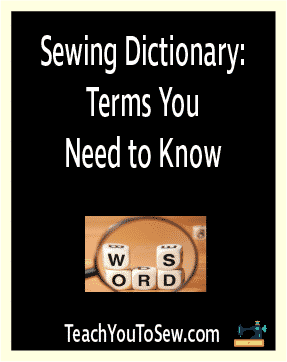 So I thought it would be a great idea to put together a sewing “dictionary” that will help you understand and get familiar with most common sewing terms that you’re likely to find those sewing pros out there using all the time. There’s a button or lever on your sewing machine that allows you to “back-stitch.” If you couldn’t already tell, it’s simply the process of sewing backwards. One of the most common uses of back-stitching is when knotting the fabric. Generally speaking, to baste means to sew very loose and long stitches. It requires setting your machine at the longest possible stitch setting. Another important part of the basting process is to not knot the thread when the stitches reach the end of the fabric. This is because basting is usually only used to hold a fabric in place, or gathering the fabric, while you work on it. Bias is the part of the fabric which is at a 45 degrees angle to the grain of the fabric. And the grain is basically the relative position of the warp and weft threads of the fabric. Working on some specific sewing patterns will require the use of a bias tape. You can easily find bias tapes at a fabric store, or even make your own if you’re willing to invest some time learning the process. A bias tape will come pre-cut at the bias area, and is primarily used for making an edge on some sewing items. The bobbin is the thread that emerges from the bottom and connects to the thread from the spool. You will have to wind the bobbin thread and put it in the machine properly to let it get sewing in a smooth and safe manner. As the name so clearly suggests, buttonhole is simply a hole sewn to let a button in. Most machines today would sew buttonholes for you all on their own. Here’s our buttonholes and appliques guide. Believe me, this one’s simpler than it sounds. Just imagine a large piece of fabric lying in front of you. You go ahead and cut it right through the middle, first vertically and then horizontally. The foot pedal is the part of your sewing machine that you can place your foot on and press to control the speed of your machine’s needle. Available at your local fabric store, fusing is used for sticking together two different pieces of fabric. To use fusing you need to keep it on the fabric with its resin part in contact with the fabric, and then just iron it. Then peel off the thing at its back and iron it again over the fabric you want to place it on. You will need to “gather” the sewing item you’re working on when creating ruffles. Gathering involves baste stitching the fabric, then holding the ends of the thread and pulling them, making the fabric gather. You can keep gently pulling the ends until the fabric is gathered to your desired extent, and then sew the ends. Many patterns may require you to hem the bottom of the piece of clothing you may be working on, depending on the exact pattern and other factors. To hem is to simply fold over the bottom of the piece of clothing, about 1/2”, and then fold it again with the folding length being the same. This is done to prevent the raw edges from being visible. Finally, sew the folded part and you will be good to go. When you want to have a knot on your fabric while sewing, you will need to sew an extra 1 inch than you actually want to, use the back-stitching option to go back sewing over that extra 1 inch, and then sew forward again. Lining is basically adding an inner layer of fabric to your main fabric. This is done for a variety of reasons, ranging from making the finished piece of clothing more attractive to making it less transparent. Usually, a neutral, solid color turns out to be ideal for lining. As you likely already know what pins are, we wouldn’t discuss them again. However, pin cushions are something that you could probably do with knowing a bit more about, so let us get to that. The thing is, a cushion here doesn’t necessarily mean that it will literally be a soft “cushion” holding your sewing pins. It can be something magnetic as well, which is actually a pretty clever idea if you really think about it, as you will be able to get around the otherwise common and annoying problem of pins falling off of the cushion if you’re not careful with the way you put them in it. Given we have used this term a few times already in this article, it only make sense to explain it too. Well, a raw edge is precisely an edge of the fabric that has been cut. It’s the length of fabric between the stitch you’re sewing the edge of the fabric. Seam guides are kind of a part of your sewing machine that help you figure out the right seam allowance to work with. Seam ripper is a tool with a sharp metal part that’s used to tear seams when you make a mistake. You simply need to put the sharp metal part under the stitch or seam you want to remove and pull it forward. As against a raw edge, a selvage is a finished edge. It’s usually the edge of a newly bought fabric. A top stitch is making an extra stitch on top of or beside the one you have already made. It’s usually done as a decoration, but sometimes also to add extra functionality to the end product. Some patterns involve sewing the right sides of a fabric together. While working on such patterns, you may have to “turn” the fabric, which would mean pulling it through an opening in order to have the right sides facing outward. It’s like a belt that’s made of a fabric-like material with braided straps. It’s commonly used in making straps for bags and backpacks. You should be able to find it at all sewing supplies and accessories stores, including online stores.